ST. GEORGE — Graduate students from the University of Utah’s Department of Psychology Outreach Committee came to Cedar City in May to present to 11th graders at SUCCESS Academy high school. Given the positive feedback to the presentations, the committee is planning to send another group of students to both Cedar City and St. George this fall, as well as other rural locations in the state throughout the academic year. As part of the presentations to over 60 students at the SUCCESS Academy early-college high school, the Ph.D. students discussed their individual research programs, graduate school in general and what the University of Utah had to offer in terms of undergraduate education and success. Committee member Robert Vlisides-Henry said the juniors were unafraid to ask questions, and many stayed after the presentations as well, eager to talk to the graduate students about their own academic interests and ask about what scientific research was like. Ben Kaufman, current principal at the Dixie State University SUCCESS Academy, said he was pleased with the event and is working to get the committee to come to the St. George campus as well. “It was great to see students interacting and learning about the different fields of study that are within the vast field of psychology,” Kaufman said in a media release. 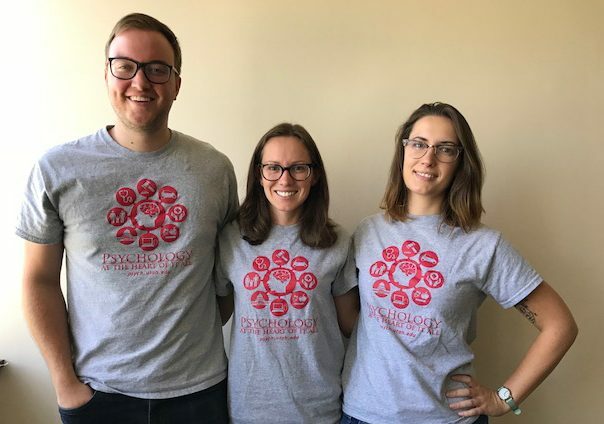 The Outreach Committee is a young organization in the department of psychology, with a stated goal of diversifying the University of Utah student population, as rural students are highly underrepresented nationally in higher education. The presentations are not limited to SUCCESS Academy students; the committee is encouraging administrators from other schools to host them as well. The group’s rural focus took form last fall when Vlisides-Henry contacted members of the Utah Rural Schools Association board about possible outreach to their schools. Shannon Dulaney, chair of URSA, invited Vlisides-Henry to speak to the board about their proposed work in February 2018. Vlisides-Henry, fellow graduate student Grace Nicora and Outreach Committee faculty advisor Dr. Jeanine Stefanucci went to the Utah Capitol to present to the URSA Board. After presenting, the board approved their proposed outreach efforts and put the group in touch with Kaufman, who later invited the group to Cedar City. Stefanucci, who is also the director of undergraduate studies in the department of psychology, said in the media release that she was thrilled to see this outreach occur. Vlisides-Henry is all too aware of the disadvantages many rural students face compared to their urban peers, having grown up in a town of less than 1,000 people in Illinois. Simply put, he said, rural students often lack many resources that are helpful in terms of academic success. For instance, URSA has reported that despite being just as likely to take science courses, rural Utah students are less likely to be enrolled in Advanced Placement science courses. This is likely because there are far fewer AP classes available in rural schools, Vlisides-Henry said. Similar research by Means, Clayton, Conzelmann, Baynes and Umbach demonstrated rural high school students are less likely to attend college than their urban peers, despite the support of their smaller, tight-knit communities. This is where the Outreach Committee wants to intervene. Members of the committee are striving to share psychological science with high school students. Vlisides-Henry said he hopes to bring several members of the Outreach Committee back to both the Cedar City and St. George SUCCESS campuses this fall. Additionally, he intends to start a mentoring program with members of the committee helping guide high school students through the college application process. Interested students are encouraged to email the group at utahpsychoutreach@gmail.com or call the University of Utah psychology department and leave a message for Robert Vlisides-Henry at 801-581-6124. Any administrators or educators interested in a presentation by the Outreach Committee are also encouraged to contact the group. Written by ROBERT VLISIDES-HENRY, University of Utah Outreach Committee.